Looking at frequent replacement lenses, we can assume that we know neither the exact base curve nor the sagittal height (SAG) nor the lens design . The only known parameter is the diameter of about 14mm. Nevertheless, frequent replacement lenses have applicability in many cases. However, if a cornea is outside of average or a required power is not available, then we need to fit customized soft lenses. There are also many other reasons to fit individual lenses, such as the pursuit of a perfectly aligned lens design to achieve best fitting success, permanent in-house selling or long-term customer loyalty. Improved determination of corneal topography and corresponding technical adjustment of lens design allow us to fit top-level customized lenses. The diameter of a soft lens should be bigger than the cornea depending on its size. We prefer a linear increase of lens diameter depending on the corneal diameter calculated by a defined factor. Base curves of soft lenses are traditionally flatter than the flat K of the cornea. Whether standardized or custom made, most lens designs are monocurves, bicurves or apheric. Due to flat fitting and resulting deformation, soft lenses change their characteristic shape on-eye, induce tension and shift power to minus in vivo . All of these disadvantages result from flat fitting. It would be more ideal to have a corneal alignment fitting technique as with RGP lenses. The challenge of this objective is to design a soft lens with perfect fitting accuracy (Figure 1). The importance of SAG is beyond dispute in fitting soft lenses today. The sagittal depth varies when changing base curve or diameter and ultimately determines the lens fit. 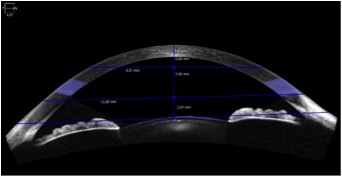 But if we pursue the goal to create a soft lens as precisely aligned to the cornea as possible, lens shape plays a role that is equally as important as the overall sagittal depth. Figure 2 shows three geometric bodies with the same SAG. This simplified illustration shows that sagittal height is not the only crucial factor if we want to achieve an alignment fitting technique. We have to think about the shape of the lens as well. We have seen that we need a new understanding to implement a new corneal alignment technique in soft lens fitting. When we look at the shape of the cornea (Figure 3), we can identify different zones from the center to the periphery . The center of the cornea is approximately spherical, followed by an elliptical zone with different degrees of flattening. Using this knowledge, we have tried to design a contact lens that includes three different SAG-zones conforming to the shape of the cornea (Figure 4). A critical and nearly incalculable point for best lens design is the measurement of the corneo-scleral profile (CSP), which includes the peripheral cornea, corneo-scleral junction angle and limbal sclera. The angle of the corneo-scleral junction tends to be sharpest at the nasal area and flatter elsewhere. The CSP has an asymmetrical shape . However, it is almost impossible to accurately determine the CSP with a slit-lamp as used by most contact lens practitioners. The subjective assessment is nearly nonreproducible . Therefore, we designed a SAG3-zone with a tangential character following a non-axial radius that flattens toward the periphery and therefore covers a large number of different CSPs. We can control SAG1, SAG2 and SAG3 segments individually by modifying their shape and/or changing the angles between the zones (Figure 4). The shape data is derived from corneal topography. Hence, it is clear that a topographic system that is capable of a larger measuring zone is desirable and provides better results. New technologies will achieve this capability in a better way in the future. Certain requirements remain essential when evaluating lens fit. The lens must move, but only up to 0.4mm - this is sufficient. Several studies have shown better comfort when the lens moves less . Greater lens movement up to 1mm results in discomfort because the lens edge crosses into the limbal zone . Using this new fitting technique, the push-up test is particularly revealing. When pushing the lens with the thumb or forefinger, the lens should move quickly and without applying pressure. After the lens has been moved, it should reposition immediately. When looking upward, the lens should remain centered on the eye. Taking the corneal alignment technique of RGP fitting and transferring it to customized soft lenses, our aim is to create a lens design that is based on the shape of the cornea and corneo-scleral profile. The proposed lens design fulfills this requirement. The result is a very comfortable soft lens because of decreased lens movement and reduced tension. Another advantage is the good and permanent centration of the lens, which is important in terms of fitting multifocal designs. An additional aspect is that the lens maintains its shape without deformation. Therefore, there is no power shift on-eye. Furthermore, it does not matter which material is used. Because the lens does not sag, modulus has no influence on the lens fit. Altogether, the corneal alignment fitting technique in soft lenses is completely different from the previous flat-fitting technique. Benefits include improved comfort, no tension on the cornea, no deformation of the lens and good predictability of fitting success when using topographic systems. Van der Worp E, Schweizer H, Lampa M, Van Beusekom M, André M. The Future of Soft Contact Lens Fitting Starts Here. Contact Lens Spectrum 2014; 6:30-36. Mario Rehnert discovered his enthusiasm for contact lenses while studying. 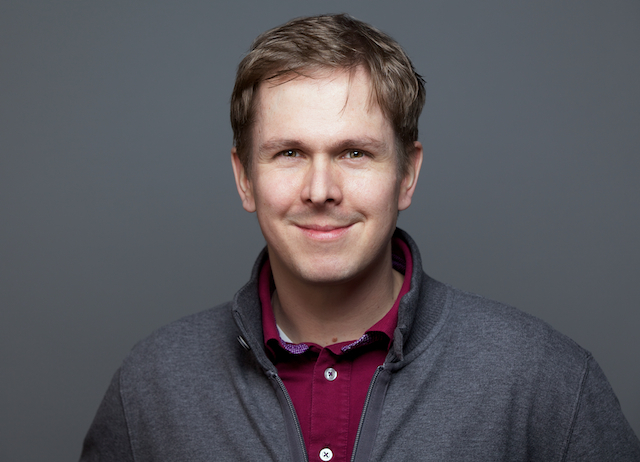 After his thesis and project management at Hecht Contactlinsen GmbH in Freiburg, Germany﻿﻿, he worked for eight years as a lens fitter at Contactlinseninstitut Miller in Innsbruck (AT). Since 2014, he has resumed working at Hecht in product engineering and project management.